Now days everyone wants to looks fancy and can’t wait for some special occasion to transform their looks. London could be a perfect place for social occasions where one can have fun where fancy dress is involved. People in London also organize fancy dress parties as a pass time; these parties not only provide a reason for gathering but also let people shed their inhibitions for fancy dresses. The city provides a great variety of occasions like Christmas, Halloween and Easter to put fancy dresses. Here are some shops from where people can choose their favorite fancy dress and brag. The brand started its operations in 1987 located in Islington. The brand gas earned goodwill for the professionalism and style. The brand’s major clients are BBC, Channel 4, Granada and many film companies from UK and abroad. They offer an exciting range of real looking attire and trimmings but at a moderate price of £80 per outfit for a week’s hire. Their awareness to detail makes them a popular for drama encouraged dress. It could be your official source for class and reasonably priced costumes. Whatever may be the occasion the shop can offer the trendy and elegant costumes. Their dresses allow the person to stand out from the crowd. Armory, Hen and Stag Accessories, Fancy Dress, 60s, 70s and 80s Clothes. 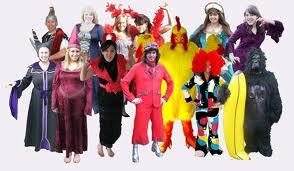 The shop offers many options for theme and fancy dress parties and one is bound to get spoilt for choices. The shop offers 35,000 costumes on hire and ranges from Abba to Zippo the clown and from Animals to Fruits and Vegetables. There are total 3 shops under the brand located and different places.